I’m tired, and need to sleep. I need to lay still under covers with baby and husband, and feel my own beating heart, and hear our soft breathing. But I just want to say that it is so refreshing to hear the voices of so many expressing their authentic emotions as we connect through this project. So often, our culture forces us to happy-away our feelings. Sad? Pop a pill. Angry? pop a pill. Don’t talk about things that are unpleasant, please say you’re fine when someone asks. But maybe you ARE actually sad, or mad, or anxious. Maybe that is your animal body telling you that something is wrong. That the world is in collapse, and many are suffering. If we are forced to be positive ALL THE TIME, we can NEVER take the time to notice that many things about our world are actually very wrong. And if we aren’t allowed to feel these wrong things, notice them, talk about them, mourn them, well then, we can never hope to FIX them. And by all means, find the joy in every moment, second, tick of the clock. Like I’ve said before, if we weren’t in love with this planet, and each other, what would be the point of fighting and protecting? But, let’s just allow ourselves to feel what we’re really feeling. And think about WHY we’re feeling that way. Let’s just warm up to the idea of authenticity. Tonight we are INSANELY lucky to have TWO guest pieces. The first one, Splash of Color, by Anonymous, and the second, On Being The Change, by my friend and fellow Mama, Tere V. Thank you both for opening your hearts and sharing. Show me who you are when all your color is gone. Are you a shadow where a rainbow once stood or a cloud in the midst of a storm trying to find its way? Who are you when the judgement is gone and all you have left to fear is yourself? There is a you in that darkness, not waiting for acceptance, but just remaining, still. What about you? Where are you hiding? What are you afraid of? REACH! Reach so far down that you find your truth and rip yourself from fear. Cry out, it’s your truth! In autumn leaves change color before they fly away. They are speaking to us, sending us a message…. The red of the maple leaf sings of change, while the bright yellow oak displays a competency dance, both grateful for the short time they lived with the branch, they let go! I watched the wind blow leaves off of a maple tree the other day. I wondered why they had to go in the first place. What was it about the first leaf to blow that made it easier for the next to follow? What I realized was; although from afar they gave the impression they were all the same, from spring to fall, bud to shed, each leaf was specifically original. 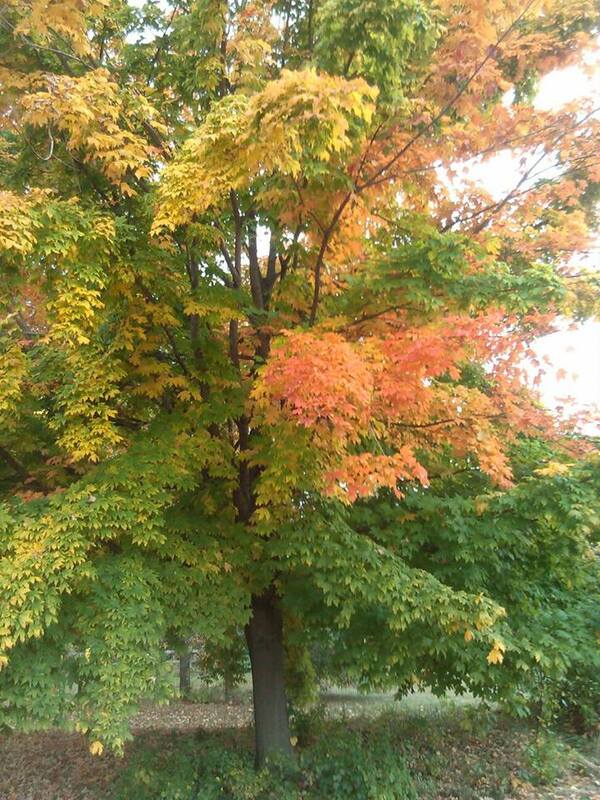 The leaves change their colors as if it were a warning when its time for them to let go. Show your color. Speak in TRUTH. Love in light- the time for letting go is NOW. My solidarity is in silence Shedding that which no longer belongs to the the dreams my soul created. Mourning for my own heart and the hearts of my sisters and brothers. With my splash of color i am reminded of what could be. I remember reading a quote by Ghandi when I was younger, in passing, and making a quick note that his sentiment sounded wonderful, but was probably too lofty of a goal for me. Too far out of reach, too hard to attain, right? Fast forward ten years to the moment I am awake in the dead of night, nursing my infant daughter. I have my hand on her head, feeling the soft spot in the middle of her skull, and feeling overwhelmed at the reality that I created this child, virtually unaided, within my body. No one had to instruct my body how to form her, create her bones, nourish her developing brain. A moment later, the crushing instinct to protect this immensely fragile being, to whom I am forever connected, clutched at me. My brain runs wild, I have to protect her, I’m moving far away and homeschooling her! She’ll never have to be exposed to the horrors of the world, or to anyone, ever, who wants to cause her harm. And there is horror everywhere. Pictures of babies in their diapers who never woke up after a chemical attack took their lives. That could be MY daughter, in my heart it feels like it IS my daughter. Breaks me in two, wakes me up at night. Terror pressing behind my eyes. A piece of my heart is exposed to the world and I have NO CONTROL. Back to the breath. Breathe. Relax my muscles. For in this moment of panic I am missing the face of my daughter, looking at me with heavy lids, beginning to doze. Yes, this is just right. Right here, with her. She deserves to have me with her right now. And Ghandi enters my awareness again…”But we shall go from love to love and peace to peace, until at last all the corners of the world are covered with that peace and love for which, consciously or unconsciously, the whole world is hungering..” For me, this means me have to be the thing we want to see different in the world. We have to be the change. Never has this seemed more important to me until now. I understand, unequivocally, that I need to be the strength, the vulnerability, the presence, the compassion that I want her to practice as she grows. I understand that children learn how to be by experiencing who their parents ARE, not who you tell them to be. A child learns so much about how to treat themselves, manage difficulty, and how to treat the world with compassion and CHANGE it from their parents. When we are gone, our children care for themselves as adults the way they observed us caring for ourselves. I don’t think she needs me to be perfect. I think she needs me to be willing. When my daughter meets adversity in her life, when she encounters hurting people who want to hurt her the way they have been, or when she has her heart broken, how do I want her to take care of herself? My resolute answer is I want her to remember that she is worthy, inherently good, and LOVED. Loved. Immeasurably. Without bounds. I want her to be fiercely committed to herself, the way I am to her. And now, the way I am pushed to be for myself. I want my daughter, if she chooses, to find a partner who loves her and is committed to her, all parts of her. I want her to be able to create relationships that are supportive and loving and reciprocal. So, I will continue to create this for myself. I am required, with this wish, to invest compassion and intention into my marriage, into my friendships, into my family – immediate and extended. body unquestionably, regardless of its size and shape. I want her to face down her fears and eventually hug them out of existence. I want her to be patient with herself, I want her to laugh and be silly and creative and explore. I want her to be light with connection to God and her wise self. So, I will practice all of those things myself. I want her to understand that she is capable of making a change in the world. I want her to be able to feel the immense grief of seeing that the world is full of much suffering and violation. I want her to not let this grief paralyze her, and keep her from supporting others in changing. I want her to solidify her connection to Life so that she can teach others to do the same. As her mom, I will continue to be patient with myself as I grieve and find ways to reconnect myself and others to their hearts. I want her, if she chooses, to be a mom who is humble, strong, connected, earthy, unsure, stubborn, and willing. I know that I am all of these things myself. Being the change. It spirals out, comes from me, to my daughter, to the people she touches. I am grateful to life, to her, for stretching me out.